Here's a dress that I draped this weekend. Originally, I had sketched out more of a shift style dress that had a small amount of gathering under the empire waist. However, when I draped that and sewed up my muslin, it didn't look quite right. 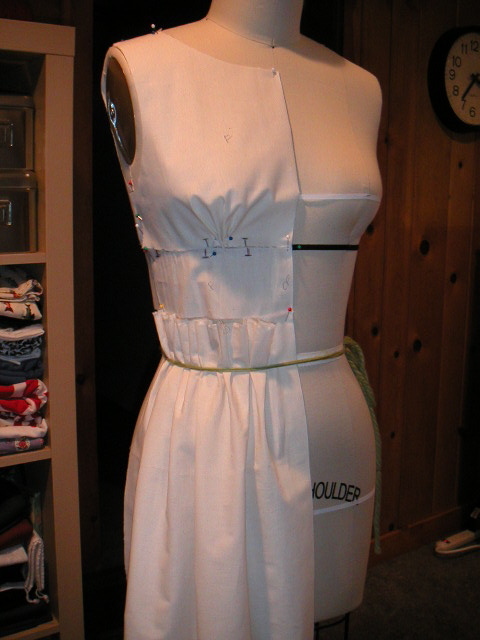 So, during my second round of draping, I ended up adding a gathered skirt all around. I wanted this to be a retro-styled day dress and I think the gathered skirt is reminiscent of that. I plan to use these fabrics that I bought a while back for the final dress, but I need to sew another muslin first to check for fit.